as most of you will probably know by now, I’m staying in another city (Leipzig) for 3 weeks this month. I rented a small room in a shared appartment. And by small room, I mean small room 🙂 Not to say… it’s tiny 🙂 Well, unlike when I’m really travelling I was able to carry basically as much stuff as I wanted. I rented a car and so I didn’t have to worry about fitting all my stuff into bags and suitcases. But still I had to limit myself as least a little bit in terms of what to bring. I wanted to quickly tell you which things I though I should bring. This shelf and a clothes rail are all I have for my stuff, that’s why everything’s so crowded. The two boxes you can see in the middle of the picture are stackable and you can close the top one with a lid, so that’s what I usually do to gain some space. On the left you see some of my jewelry. I really didn’t bring a whole lot, I limited myself mostly to things that fit into the little pouch you can see in the background. I got that at TK Maxx last year and loooove it! It is covered with little rhinestones! Next to that (in the back row) you see my haircare and -styling products, creams, and perfume. From left to right I have the L’Oreal Ever Pure Moisture Deep Restorative Masque. I’ve got the shampoo from that series as well, but that’s standing in the shower. I really like these products, they’re sulfate-free and smell like herbs. Mhhh! Next to that you see my hairspray. It’s just the Taft “Glatt & Glossy” with medium hold. I like it, got nothing special to say about it. Next to that is my oh so loved “Helping Hands” by Lush. This hand cream is a-ma-zing! It gives instant moisture to your skin without leaving a yucky residue… Love it!! Next thing is a volumizing powder by Taft. For a long time I hated this product, I even thought about throwing it away until I went to the hairdresser one day and told her about it. She asked me how I used it, I explained and she told me I had been using it the wrong way! 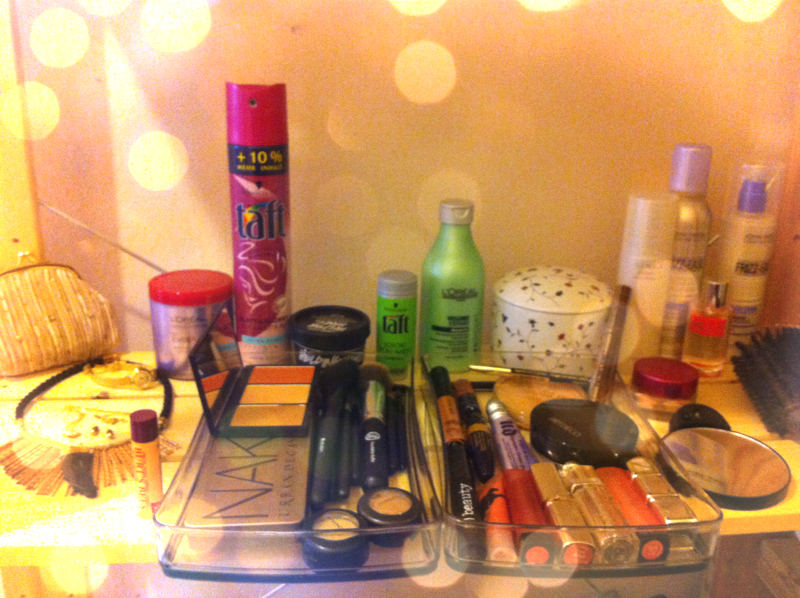 Duuh… Ever since she showed me how to use it correctly I really really like using this product! I’ll write you a little tutorial on how to do it if anyone is interested – just let me know 🙂 The bigger green bottle holds my L’Oreal Serie Expert Volume Expand shampoo. Yes, it does give volume, but it also tends to dry out my hair a little. That’s why I don’t use it on a daily basis. The white porcelain jar with the flowers on it is from Ikea. I keep my hair ties, clips, bobby pins etc. in there. Nothing too exciting really. Next to that you can (actually not really) see my Kanebo Sensai Silk Emulsion. I’m so satisfied with this! Ever since my cosmetician has recommended this for my skin, it has improved so much! So obviously this was a must-bring product! On the far right side you can see two products from John Frieda. One is the “Tägliche Wunderkur”, a stay-in conditioner that I use regularly. It also serves as heat protection. The other one is a styling foam for creating curls which – to be honest – I haven’t tried yet. I bought it here in Leipzig but haven’t gotten around to curling my hair yet. Between the two is one of the perfumes I’m using right now, “Sport” by Jil Sander. I have other perfumes with me but those are only samples. In the boxes are all my make up essencials. I’m not going to go through every single one of them, you’re getting the point I guess. My Naked 2 palette, two matte eyeshadows by MAC, brushes, my Sleek Face Form palette, lip glosses, lipsticks, mascaras, Urban Decay Primer Potion, fixing powder and an eyebrow pencil. The pot next to it with the pink lid is the foundation I’ve been using for a very long time now as an every-day foundation. It’s the L’Oreal Matte Morphose in the shade 110, Ivory Rose. The coverage is light to medium and it feels really good on my face. It stays put even on very long days. Fot going out at night I usually use liquid foundations, but this one was enough for my stay in Leipzig. Well, I guess that’s about it! As you can see I brought a magnifying morror with an LED on top which is perfect for plucking eyebrows. You also see my round brush with boar bristles, I also brought a paddle brush. And, last but not least, my Burt’s Bees Acai Berry lip balm. This was a lot of information 🙂 If you have any questions on the products or what I use them for – feel free to ask! Have a great rest of the week! I love this about Glossybox and other services, you get to try out things that you possibly wouldn’t have learned about otherwise. Next thing I got is a Soft Eyeliner by LAVERA in black. It it double ended, one end is the eyeliner – obviously – and the other end holds a little sponge for smudging your eyeliner to create a smokey eye look. LAVERA uses very natural ingredients for their products. I think especially if you like lining your waterline or anything very close to the eyes natural products are always a good choice! You can find the eyeliner online by clicking here. this Lush “Each Peach” massage bar in my Glossybox. I have never tried these massage bars but I’m excited to do so! Find out more about is here. I also got a shampoo by René Furterer Okara. It’s called “Active light” and is made for highlighted hair especially. That comes in quite handy as I do have blonde highlights. I haven’t tried this yet so unfortunately I can’t tell you anything about it just yet. You can find the product here. The last one of the regular 5 products you get was this eyeshadow by “Rouge Bunny Rouge” in the color “Mountain bluebird”. I’m not very much into blueish eyeshadows but I’m always very happy to receive make up items in my Glossybox so I’ll definitely give it a try! 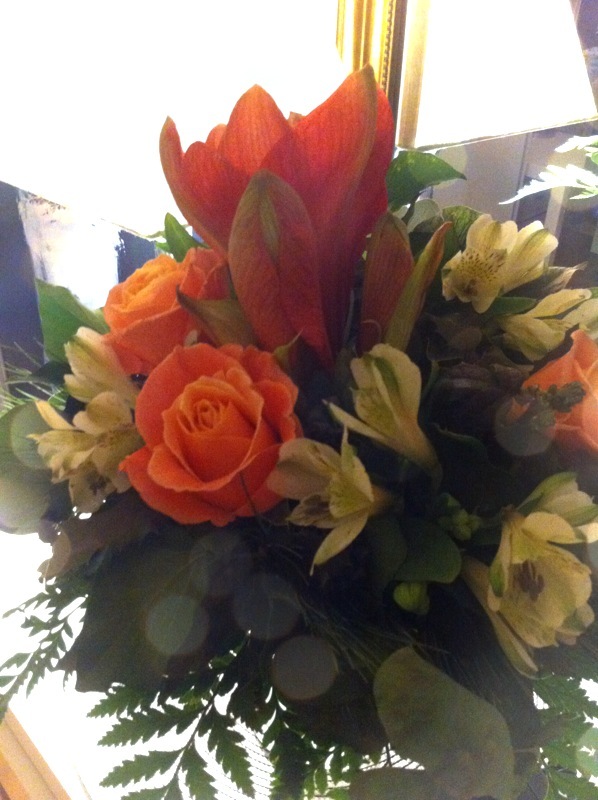 Last but not least there was a 6th product – yay! Eyelashes! They are labeled with “Glossybox” so I cannot tell you which brand they are originally from. Glossybox has been puting things like that in their boxes for a while now – so far I got a blush brush, I heating pillow for your coat pocket, a blush etc. Love that! Merry Christmas to everyone! Only a few days to go! some of you might have seen my post about about my beauty related birthday presents. 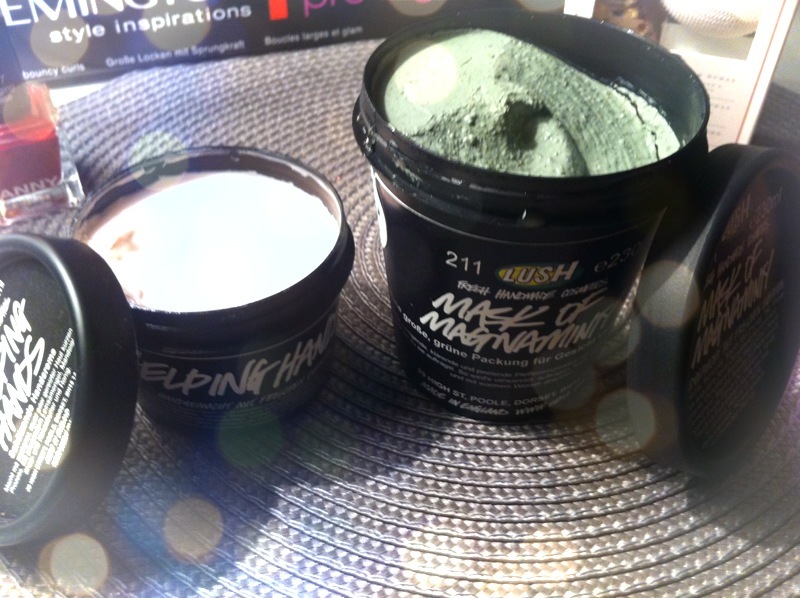 One of those presents is the “Mask of Magnaminty” by Lush. Well, this weekend I’ve found the time to finally try it out! The description on the back tells you to apply it on your face (or body, according to Lush it is very good for the skin on your back as well! ), let it dry on the surface (not all the way through) and then rinse it off with some water. I let it dry for about 10 minutes and for me, that seemed to be just the right time! I’ve told you before that the mask kind of smells like the impression compound dentists use. It has a minty kind of clay scent to it. It took me a minute to get used to it, but now I actually find it quite appealing! 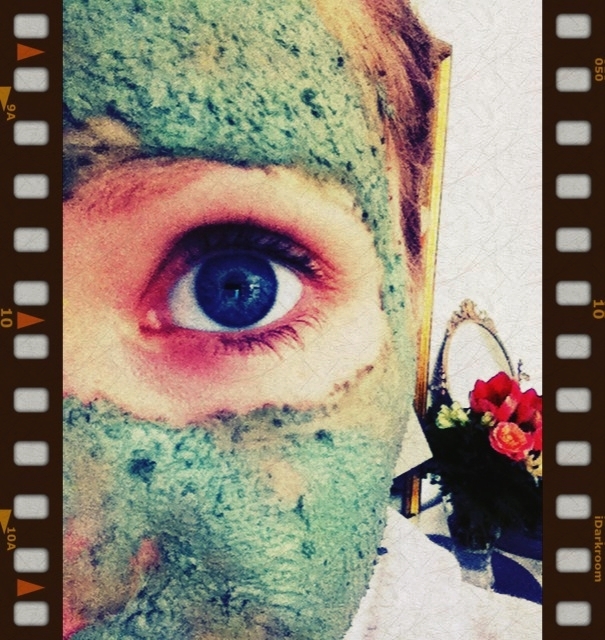 The mask feels very fresh and cooling on your skin, the effect compares a little bit to chewing menthol chewing gum. It does not cause an uncomfortable feeling of tension on your skin! My skin felt really fresh and clean after using the mask. I’m quite sure my skin looked smoother than before, my pores were minimized and the little wrinkles on my forehead (yes, guys, I’m 26…) looked smoother as well! My skin looked just bright, youthful and healthy. Even before applying my usual face cream my face didn’t have any feeling of tension at all, which is quite unusual for me as very often cleansing masks leave my skin to be very dry. After all I can really really recommend this product, I’m so happy with it and will definitely repurchase it! It was my birthday last week and I would like to show you some (beauty related) goodies I got from my family, friends and myself. Yes, I do like to present myself with something I’ve really wanted for a while on special occasions 🙂 Thanks to everyone! I got so many beautiful presents this year, but the best present was that so many people came by to celebrate with me, thank you!! 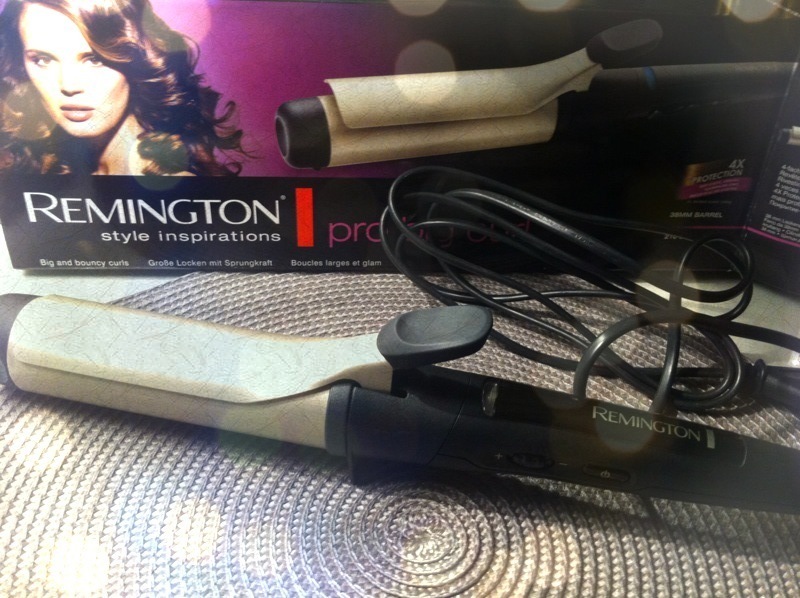 First thing I got is this Remington “Pro big curl” curling iron with a 38mm barrel. I’ve used this while getting ready for my birthday party and absolutely loved it! It creates very soft, natural looking curls, I personally like to curl my hair away from my face for that summery beach look. It’s not easy to create crisp curls that stay for a long time in my hair though, I’m still on the lookout for a good product that will help my hair hold the curls better and also protect it from the heat of the iron. If you have any tips for me, please let me know in the comments below! 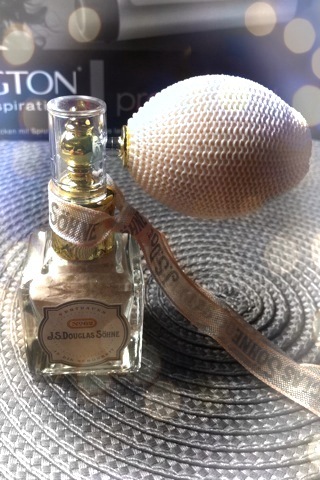 Next thing I got is this awesome powder spray from J.S. Douglas Söhne. It’s a golden sparkling scented powder spray that I will definitely apply on my décolleté, hair or legs for Christmas or New Years Eve. It smells amazing, just powdery, soft and very feminine. A friend of mine chose this for me because she said it seamed it had my name written all over it in capital letters 😉 Thanks so much! At my party we started spraying each other with and felt like princesses. The thing I love about the most is probably the applicator. It looks so vintage! Once the flacon is empty I will try to fill it up with perfume or something. I especially asked for two Lush products, the “Helping Hands” hand cream and the “Mask of Magnaminty”. My best friend has the “Helping Hands” in her bathroom at all times and every time I visit her I love, love, love using it! One day, when she asked me if I had a birthday wish, I told her about my having fallen in love with this cream and she actually went out to buy one for me 😀 Yay for that! It it really rich and nurturing, just right for cold winter days that make your skin dry out really easy. Now let’s get to some goodies I got for myself! I have been wanting the Urban Decay Naked 2 palette for a long time now. Same thing goes for the Eyeshadow Primer Potion. Now, the problem is that Urban does not sell on the German market so I had to order it online. 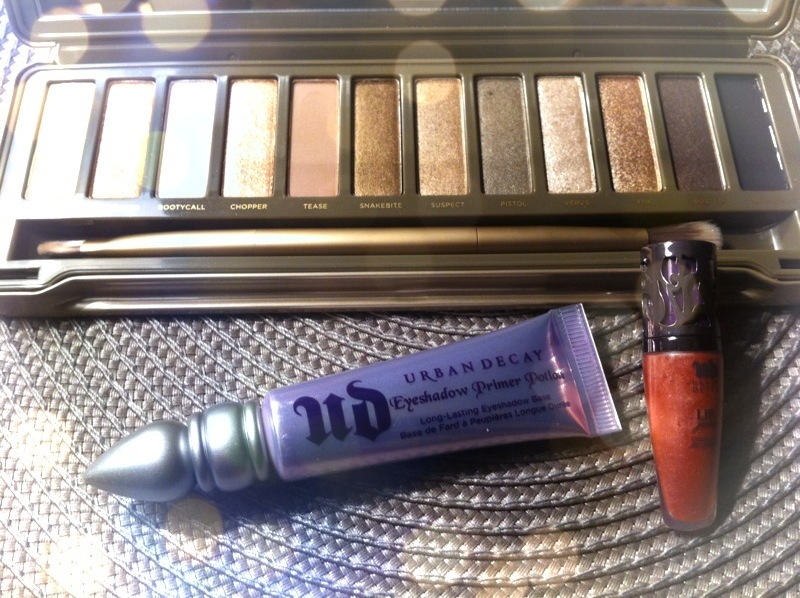 A friend of mine from the U.S. told me about a website that offers worldwide free shipping AND sells Urban Decay, so I had to try that out! It actually worked PLUS I got a 20% discount because of black friday. A few days later my package arrived and I was very happy 🙂 I’ll link the webside for you along with other links at the end of this blogpost. 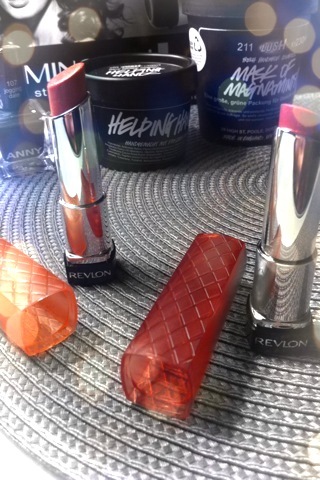 Another thing I have been hearing so much about on blogs and youtube are the Revlon ColorBurst Lip Butters. As Revlon doesn’t sell in Germany either (seriously, what is this about?? ), I had to order those online as well. I got them on ebay. I bought them in the colors “Peach Parfait” and “Berry Smoothie” and YES, I do understand the hype about those products! They feel so smooth on the lips, like lip balm, and the colors are so subtle, yet so beatiful! I am totally tempted to order even more colors online. Last but not least I got gift cards, too! One of them was for “Douglas” which is a huge German beauty shop. 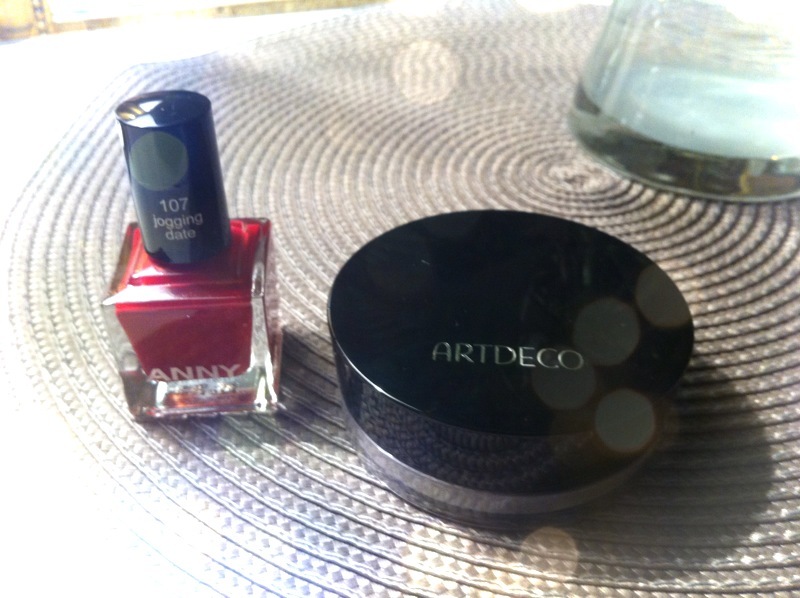 I went there today and chose the Artdeco “Fixing Powder” and a BEAUTIFUL nail polish by ANNY in the color “Jogging Date” which is a very pretty reddish kind of pink shade with a little bit of shimmer. Love it! The other gift card is one that I’m very excited to redeem, it’s a gift card for a great Spa/Wellness day with my boyfriend. I’m so much looking forward to that! Well, again, thanks to everyone but those great gifts and, above all, for being with me on my birthday and making it a very special day for me! I wish all of you a happy second Sunday of Advent tomorrow, I hope all of you, wherever you are, will have a peaceful and nice day 🙂 Do you guys already have snow as well? Thailand Series Pt. 1 – BANGKOK! Might your deodorant be causing breast cancer? !